It's the "I've Got Books" Giveaway! Feline Friday--Introducing Cat-Crazy Book Lovers! Happy day after Thanksgiving, people. Here in America, some call this day Black Friday, since all the stores have sales that are supposed to finally put them in the black. But at my house, I'm more inclined to call it Purple (and a Little Pink) Friday, because the lovely UPS man brought these to me this afternoon. I'm going to keep this simple--just leave a comment. I don't care what you say: you loved the first book, you can't wait for the second one to come out, you like cats, snow is cold. Just a comment, any comment. Monday morning, I'll pick THREE random winners and send them copies of Wickedly Wonderful. Well....what are you waiting for? Comment! Later, we went on to found The Artisans' Guild shop together, which is where most of my jewelry ends up these days. I used to make it all the time (and do lots of craft shows, and had pieces in shops around the area), but most of my time and energy is now taken up by writing. Which basically means that about a month before Black Friday, I sat up and said, "OH NO, I need to make jewelry!" black onyx and garnet with a dragon! So tell me--which is your favorite? We're planning themed days when readers can post photos of their cats too. Visit us on Monday for MONDAY MAYHEM. Do your cats get into trouble? Ours do. We can compare notes. Friday is always FELINE FRIDAY. Every cat is beautiful, and on Friday you can let yours be a star by posting his or her photo. 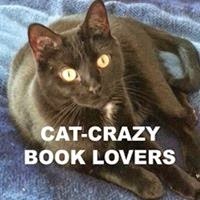 So if you love cats, like to chat with others who do too, can't get enough of cat photos and generally just want a friendly place to discuss your fur babies, the CAT-CRAZY BOOK LOVERS page is the place for you. Just LIKE the page and join the fun! (Don't forget to check GET NOTIFICATIONS on Facebook so you don't miss a thing.) And don't forget to follow these other great authors. They're cat-crazy too! So I thought, why not put a few pictures up here? And then I thought (what with the crazy and all), why not give my blog followers a special opportunity to get my jewelry ON SALE as a thanks for being so wonderful and supportive? So here's the deal. For the next week or so, I'm going to post some pictures and descriptions of some of the jewelry I've made. And here only, I will let people have 15% OFF until the Saturday after Thanksgiving. If you want a piece, just say so in the comments--first person to call "DIBS" on a piece will get it. If you have questions, ask those in the comments too. 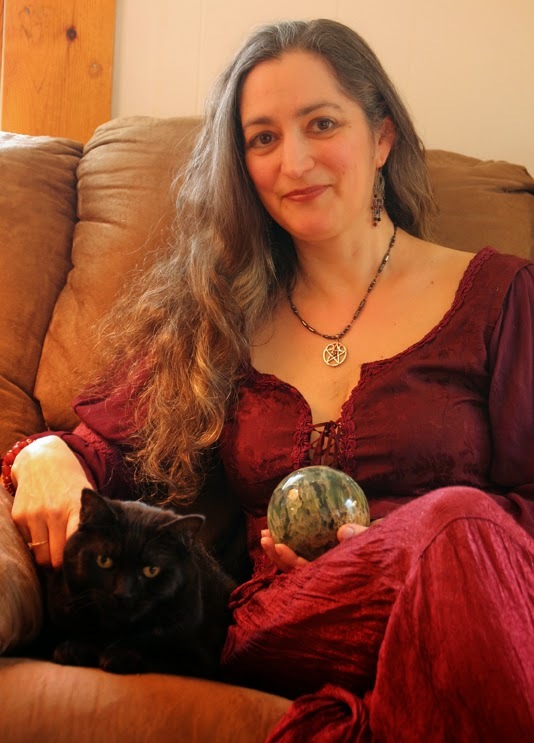 [Once you've yelled dibs, email me at magicmysticminerva at yahoo and we will work on the specifics. Paypal is usually the easiest way, but I'm flexible.] Shipping will be $5 for USA folks, and whatever the actual cost is for anyone out of the country. Most of the pictures are necklaces, but I can make matching earrings if you want (in some cases there are already earrings in the pictures, but they don't come with the necklaces unless you pay for them too). Any questions? This is all the Snowflake obsidian together, so you can see the bracelet and earrings too. Bracelet is $32 and earrings are $30--so $27.20 and $25.50 on sale. And yes, Snowflake obsidian comes from volcanoes! Labels: a day in the life, jewelry, other things I do, SALE! HOLY UPCOMING RELEASE DATE, BATMAN! Obviously, that calls for a celebration. And, you know, a mad flurry of begging people to spread the word, preorder the book, and generally make me look good to my publisher Berkley, so they'll want to give me a contract for Book 3 in the series. But mostly, it calls for a HUGE giveaway! As usual, it is *just* possible that I may have gotten a little carried away. Snort. There is a great big tote bag with the Wickedly Wonderful cover on one side and the Wickedly Dangerous cover on the other. A Wickedly Wonderful mug, notebook, and mousepad, and a swag pack with the winner's choice of temporary tattoo packs (dragons or mermaids), plus bookmarks, postcards, and magnets. There is also a signed copy of Wickedly Dangerous, since I don't have my author copies of Wickedly Wonderful yet. If the person who wins the book already has the first one, he or she has the choice to wait for the 2nd one to show up on my doorstep. You can also use the Amazon and B&N links to leave reviews, or use this link to GOODREADS (where, frankly, I could use some nicer reviews to offset a few not very nice ones). Mostly, you should just have fun! So tell me, have you read Wickedly Dangerous? Are you excited about Wickedly Wonderful coming out in THREE WEEKS? Whoo hoo! I can finally share some great news I've been sitting on for a while. (It's a little squished, but still fun.) I'm going to be a cover model! No, not on the cover of one of my books (although there are folks who think that the picture of Barbara Yager, my first Baba Yaga, looks a bit like me on the cover of Wickedly Dangerous -- yes, my abs look *just* like that...snort). 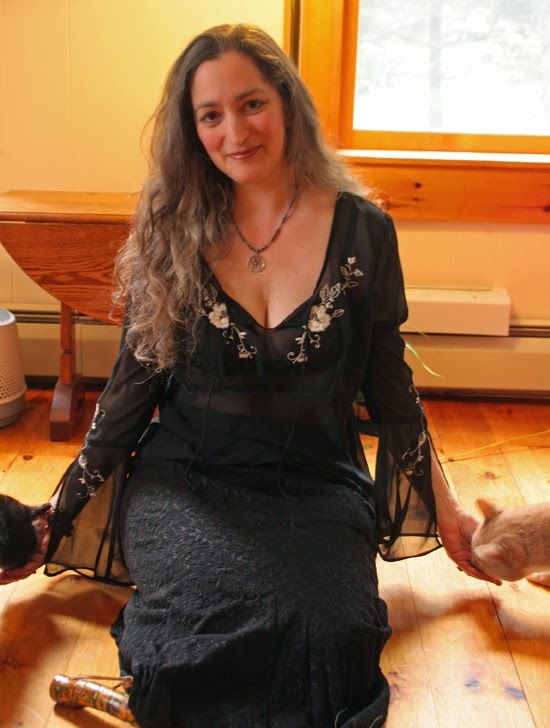 And not on the cover of Time Magazine as Witch of the Year, although really, I'm not sure why not. 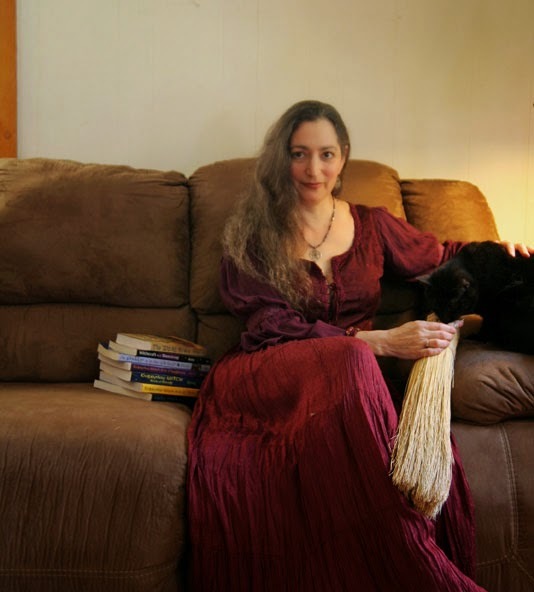 Witches & Pagans Magazine's Next Cover Girl. Look familiar? 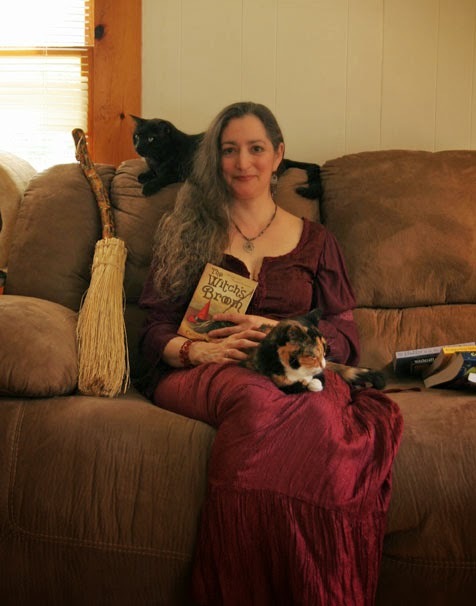 As some of you know, I write a regular column (Everyday Witchcraft) for the magazine, and I have been a dedicated reader for many years. 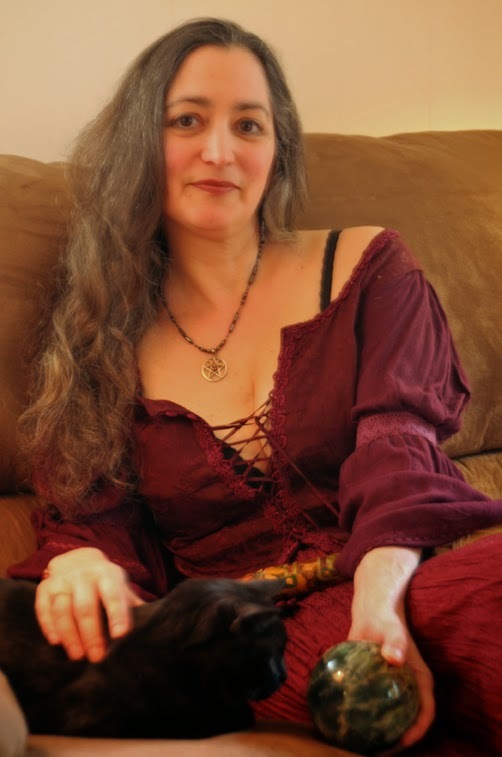 So it is pretty thrilling to be featured on the cover and in the wonderful interview inside written by my Pagan author pal Ceallaigh MacCath (you may remember that I wrote the introduction to her fabulous collection of Pagan tales and poems, The Ruin of Beltany Ring and that we were both included in The Pagan Anthology of Short Fiction). 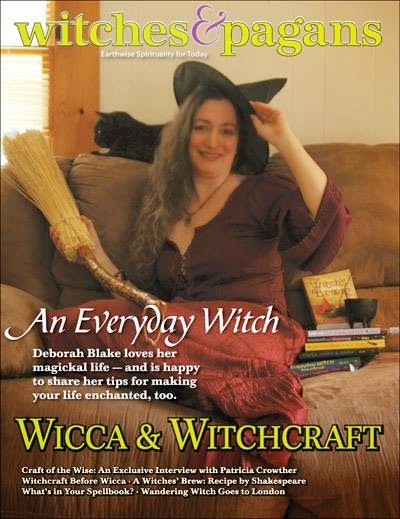 The Deborah Blake Cover Girl Issue! Of course, the preorder price of $6.45 is a deal, so you know you want to get a copy. (Mom, I'm looking at you. )The magazine will be out in December. And just for fun, here are a few of the shots we didn't use either for the cover or inside. Which one do you like best?